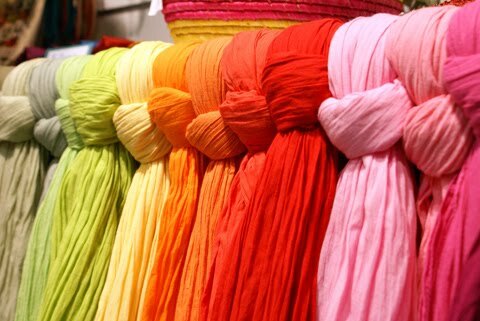 Against the backdrop of a Free Trade Agreement (FTA) being finalized between India and Israel, as they celebrate 20 years of diplomatic relations, the two nations have signed pacts to boost the textiles business. India’s Ministry of Textile and Israel’s Ministry of Trade, Industry and Labour signed an MoU on the sidelines of the first India International Apparel and Textile Trade show here to expand business in areas such as cotton, jute, silk handlooms, clothing and fashion industries. Around 30 leading Indian manufacturers of apparels and textile have put up the show to tap the Israeli market. Indian Textiles Secretary Kiran Dhingra and the Director General of Israel’s Ministry of Trade, Industry and Labour Sharon Kedmi signed the MoU that includes exchanging delegations to take this initiative forward. India’s Apparel Export Promotion Council (AEPC) also signed a separate MoU with the Israel Export and International Cooperation Institute (IEAICI). AEPC Chairman A. Sakthivel expressed the hope of a major leap in the volume of trade. AEPC and IEAICI outlined cooperation in the field of clothing and fashion industries, innovative technologies and possible solutions for the textile Industry as focus areas to enhance bilateral trade and economic relations. On 3rd August, 2012 India and Israel signed an academic research agreement to jointly collaborate in the areas of medicine, technologies, humanities, arts and social sciences. An MoU was signed in this regard between the University Grants Commission and Israel Science Foundation for launching a three-year 'India-Israel Joint Research Program' which would bring together scientists and researchers from two countries to carry forward academic research in these areas. Since establishment of diplomatic relations in 1992, bilateral trade and economic relations have progressed rapidly. From US$ 200 million in 1992 (comprising primarily of diamonds), merchandise trade diversified and reached US$ 5.15 billion in 2011. In 2011 India was the 8th largest trade partner of Israel, and 3rd largest in Asia. India is Israel’s 11th largest import source including diamonds, and 16th largest import source excluding diamonds. Balance of trade in 2011 was in Israel’s favor by US$ 844 million. While India's exports to Israel in areas other than diamonds are increasing, diamonds constituted 56.4% of bilateral trade in 2011. India is a 'focus' country for Israeli Government’s increased trade efforts (along with China and Brazil). Major exports from India to Israel include precious stones and metals, chemical products, textile and textile articles, plants and vegetable products, mineral products, rubber and plastic products, base metals and machinery. Major exports from Israel to India include precious stones and metals, chemical and mineral products, base metals, machinery, and transport equipment. According to the Israel Export and International Cooperation Institute during January – June 2012 bilateral trade was 15% down compared to the parallel and totaled US$2.3 billion.